Part of the problem with worry is that it rolls around and around in your head. It’s the hamster on the wheel. Or the monkey mind that keeps you awake in the middle of the night. Try getting those worries out of your head and into a Worry Box. Take any box and decorate it as you like and put a label on it: Worry Box. 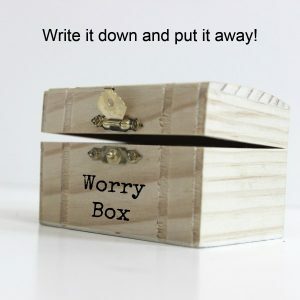 When you identify a worry, write it on a piece of paper and put it in the worry box. When your monkey mind wants to worry about it, go get the piece of paper out of the box. Make a rule for yourself: You can only worry about it while you are sitting there with the paper in hand, sitting next to your Worry Box.